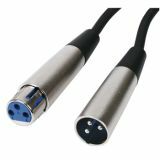 Professional cable CANON/m-CANON/f, 1m Professional audio cable from XLR (CANON) male to XLR (CANON) female for stereo signals of 1 m.
Cable, USB A M, CANON 24pin M, 1.8m Cable for data transmission from CANON camera to computer. 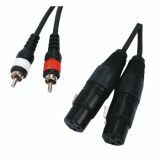 Cable, CANON/f-plug 6.3 mono/m, 6m Professional Cable CANON/f to jack 6.3 mono/m, 6m long. Professional Cable, HQM-246, 2xCANON/f-2xRCA/m, 1.5 m Professional Cable, HQM-246, 2xCANON/f-2xRCA/m, 1.5 m. High quality product from the HQ series. List Price 7.12лв. VAT Incl. 6.76лв. VAT Incl. 6.40лв. VAT Incl. 6.05лв. VAT Incl. Professional Cable, HQM-247 2xCANON/m-2xRCA/m, 1.5 m Professional Cable, HQM-247 2xCANON/m to 2xRCA/m, 1.5 m for audio signal. Cable, CANON/m-CANON/f, 1.5m Professional cable CANON male to CANON female with length 2 m.
Cable, CANON/m-CANON/f, 9m Professional cable with terminals, CANON / m to CANON / f for audio signals, 9 m.